Our March 2009 round up will cut through all of the questions you have about cutting and size reduction equipment. Reduce fruit and vegetable products and effectively increase overall cost-savings with the . Widely used in the soup, nutritional supplement, baby food, beverage and sauce categories, the precision cutting principle of this machine has proven to be a processing breakthrough. By offering a wide variety of interchangeable cutting head styles and impellers, the milling machine produces slices, flakes, shreds, viscous slurries or purees from a myriad of fruit and vegetable products. Latest beverage industry uses include the reduction of mango pulp and fibrous fruits as tropical fruit juices gain popularity. Urschel Laboratories Inc.; Valparaiso, Ind. A grinding unit has been specifically designed for producing a highly uniform grind, with unparalleled control, in various dried foods and spice applications such as candy, bread crumbs, nuts and pepper. The DFS (Dried Foods/Spices) uses a continuous roller-style method that improves yields and reduces waste. Constructed of FDA-approved materials, it provides a long service life with minimal vibration and maintained tolerances under extreme conditions. A narrow particle size distribution is produced during each use, which minimizes waste and the necessity for screening. The product design offers a high-capacity yield with maximum flexibility on final grind targets, thereby diversifying its application usage. The new is designed to provide a simple, more economical method of reducing compacted materials into a smaller, granulated product required for most processing or packaging lines. It de-lumps and improves product flow for a variety of applications, such as sugar, salt, cereal, cookies flour, and pasta. It may also be used to reduce natural agglomeration, which may occur during storage/shipping, or to reduce material deliberately compacted in densification processing. Model SCC-15 cuts hard, soft and fibrous materials into controlled particle sizes with minimal fines at high rates. It features a patented helical rotor design with dozens of cutter heads attached to a helical array of staggered holders to continuously shear oversize materials against twin, stationary bed knives. Unlike conventional knife cutters that slice materials into strips in scissor-like fashion, the cutter is configured with carbide-tipped cutter heads along the entire shaft, with no frontal gaps between the tips, making total contact with the product. As a result, the material is cut into uniform pieces with minimum fines and imperfections in the granulate, and little to no heat generation. Munson Machinery Co.; Utica, N.Y.
Poultry processors can significantly reduce labor requirements in dark meat deboning and breast trimming operations with the YieldPlus Debone/Trim Management Systems. The systems also achieve measurable improvements in portion control consistency, product yields, throughput and quality. 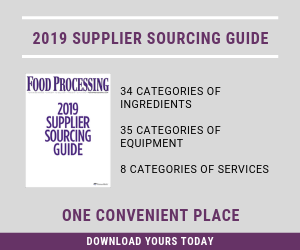 For example, users typically can achieve up to 3 percent or more in improved boneless dark meat yields, giving processors a rapid return on their investment. Meat quality is also improved by eliminating the incidence of bone fragments or cartilage at the system’s built-in quality control stations.